Pat Adams: "I designed and hand-drew this quilt years before I had EQ5. 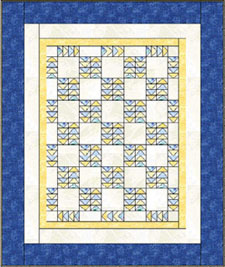 After just a few hours of using EQ5 I was not only able to recreate the quilt in EQ5 from my hand drawing, I was also able to add the actual fabric I wanted to use. I scanned my actual fabric and colored the blocks in the design."